How's Judy finding her Strictly experience? 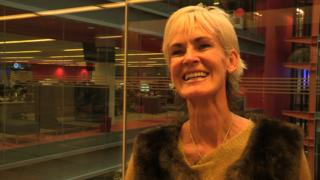 Judy Murray, tennis coach and Mum to Grand Slam champions Andy and Jamie, explains to BBC Get Inspired how she's finding her time on hit BBC One show Strictly Come Dancing. In week one Judy received some tough feedback from the judges, but she's looking forward to this week's film-themed dance with partner Anton du Beke. If you're interested in getting involved in dance, why not get started with our Get Inspired for dance pages.